Those that are close to me know I have a major weakness….. okay maybe 2 major weaknesses, and the first one is doughnuts. The second is ice cream. 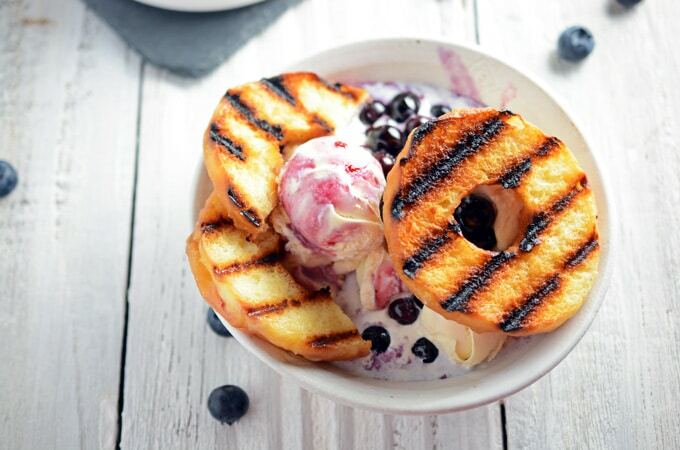 Put them together, and you’ll see me, eating a big ol’ bowl of these Grilled Doughnuts with Blueberry Sauce and loving every second of it. I typically eat doughnuts all of about twice a year. I try my best to stay away from doughnuts because I know my will power with them is pretty nonexistent. 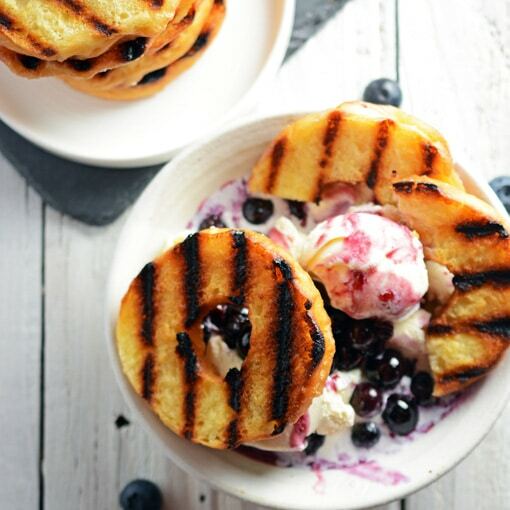 But as I flipped through my latest issue of Food and Wine Magazine I stumbled upon this heavenly recipe for Grilled Doughnuts with Blueberry Sauce. It was as if Food and Wine put this recipe in just for me! Without hesitation I started planning out the recipe. As I said before I rarely eat doughnuts because it’s my weakness, but when I decide to indulge I like to go all in! And this treat qualifies as “all in”! 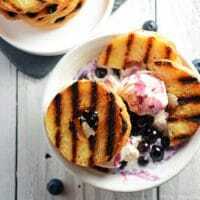 So forget those bottled ice cream sauces and jazz up your favorite vanilla ice cream and top it off with these Grilled Doughnuts with Blueberry Sauce. 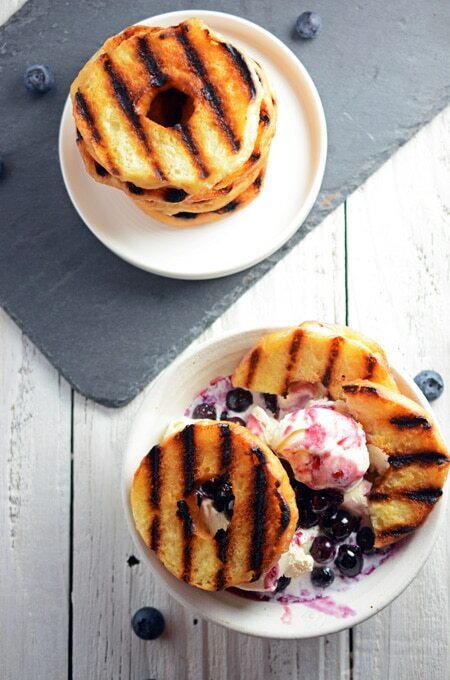 These can also be made with day old pastries such as, pound cake, cinnamon buns or challah. And don’t forget to subscribe to be the first to get new recipes sent directly to you inbox! You can also follow me on Facebook, Instagram, Pinterest and Twitter. Heat a grill pan over medium-high heat. Over low heat, in a small stainless steel saucepan simmer 3 cups of blueberries with Chambord, sugar, and a pinch of salt, stirring occasionally until the blueberries begin to burst, about 15 minutes. Add the remaining blueberries and the lemon juice and stir to combine. Remove from the heat and set aside. Spread the cut side of the doughnuts with softened butter. 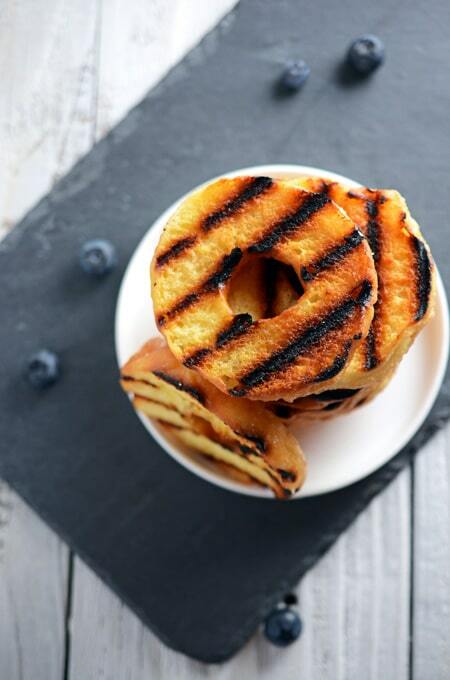 Grill the doughnuts cut side down until lightly charred, about 2 to 3 minutes. 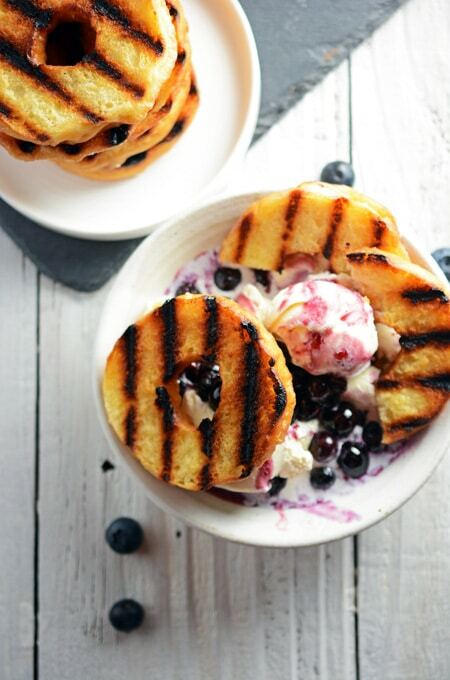 Serve with warm blueberry sauce and ice cream.